In the war against global warming, it is reported that bovine flatulence is responsible for a significant portion of methane emissions, a single cow produces about 400 quarts of the gas each day that contribute to the dreaded 'greenhouse effect' and Harper Farms is doing something about it. 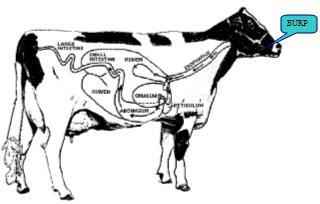 Cattle draw nutrition from grass and hay through their first stomach - the rumen - which contains large quantities of bacteria. The bacteria feed off the grass and produce nutrients which the animals can digest. But, alongside the nutrients comes the methane by-product, which is belched out and contributes to global warming. Ruminant animals are responsible for a significant amount of the methane gas produced in Georgia. "Cows can lose around 6 to 10% of what they eat to methane. This loss is bad for the cow and bad for the environment," said Kenny, CEO of Harper Farms. "It stinks too! Have you ever had a cow burp in your face? I have!" Kenny also added, "that cows don't emit 400 quarts of flatulence a day, they emit 400 quarts' worth of burps." Kenny said that he does know one end of a cow from the other. Harper Farms is working closely with the local technical institute on ways to harness and capture the unwanted gas being released into the atmosphere by the cows. This captured gas could be used as domestic fuel for water heaters, heating homes and as an alternative fuel for farm equipment. The device still under development, nicknamed the Cow-alytic Converter, looks something like a cross between a gas mask and a small hot air balloon. The burps are captured with the mask and stored in the balloon chamber. These are then bled off regularly to tanks where the methane is stored. "In addition to the capture and the re-use, the entire project would generate significant carbon credits to offset the appetite of the beef loving, tree hugging politicians and the Hollywood hot-airs that fly around the country in their private jets," Kenny said. "It is all about saving this planet and selling carbon credits. Do you want to buy some?" Harper Farms, located outside historic Madison, Georgia, raises beef cattle and its renowned Black Angus that roam the rolling acres. Visit Harper Farms at their website www.HarperFarms.com.